during his 2016 presidential campaign and throughout his presidency, donald trump has used the various communication tools available to him — press statements, speeches and interviews, executive actions, and, most notably, twitter — to undermine and question the basic tenets of american government. from the right to peaceful protest to the right of all citizens to vote, and even extending to the most basic checks and balances that keep the government functional, he has used his public platform to aggressively push for restrictions, eliminations, and interference in the regulatory systems established in united states law. "editor's notes" is a series in which i use data collected from trump and his administration between 2015 and the present to edit the foundational legal documents of american society. the "editor's notes", footnoted at the bottom of each segment, are composed of text taken exclusively from trump's own written or spoken archive (@realDonaldTrump, executive orders and memoranda, presidential and campaign speeches, and selected interviews with the press). i have collected the data and sorted this text according to content by utilizing custom software, as well as open-source data collection tools, beginning november 9, 2016 and continuing to the present. "editor's notes (constitution)", april 2018. photo by jerry mann. "editor's notes (amendments)", july 2017. photo by emily bucholz. 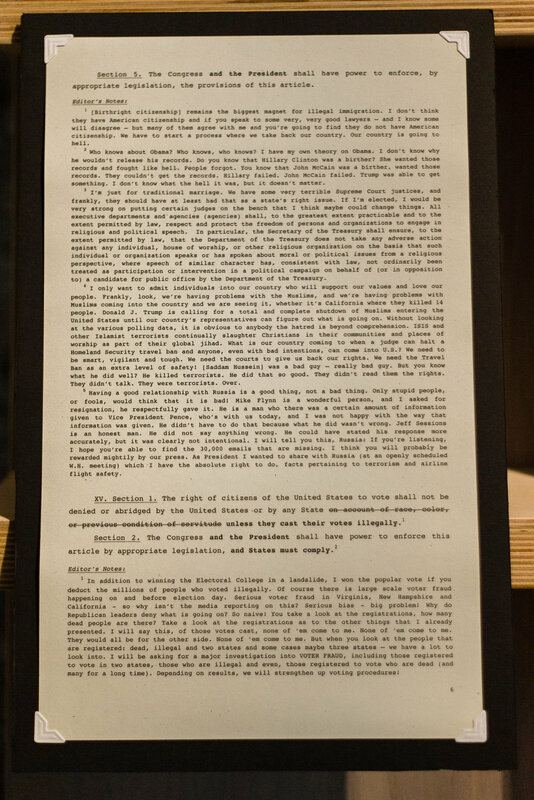 the first two iteration of this ongoing project, "editor's notes (amendments)" and "editor's notes (constitution)", examine the entirety the united states constitution, and are formatted to resemble a presidential executive order, which trump has used frequently in order to enact the more controversial portions of his platform without legislation. "amendments" was completed in 2017, and "constitution" in 2018. i am currently expanding the project to include landmark congressional legislation and supreme court decisions. "reuptake", little berlin, philadelphia PA (july 2017: "amendments"). "the FL3TCH3R exhibit: socially and politically engaged art", the reece museum, johnson city TN (oct - dec 2017: "amendments"). "20/20 hindsight = 40 years", SPACES, cleveland OH (april - june 2018: "constitution"). "roopa vasudevan: editor's notes — open editing sessions", SOHO20 gallery, brooklyn NY (july & august 2018).